I'm having a bit of a brain freeze at the moment (like the weather) and I cannot think of anything to write about. I think I have been thinking of the awakening message to much and nothing else can fit in my head. So I thought I would just share a photo from the past with you. 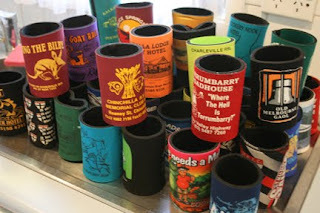 Shane loves to collect "Stubbie Holders" from every town he visits. Something had to be done when the cupboard started over flowing. Lets just say they are now out of the cupboard but are now sitting in shopping bags waiting for there new home. Haha, awesome. Must be where I get it from. Davine what is a Stubbie Holder? Does it hold beverages? Sorry Darlene I forgot we can sometimes use some strange words. Yeah it a foam cylinder to put cans in to keep them cold. Davine if they're words you're used to then their not strange, only foreign to me but now I know. That's quite the collection! I'm sure that I use terminology which you think is odd or different, just ask if you ever run across something that I'm saying that sounds odd or you're unsure of, nothing wrong with that at all. Have a good one!